How do you close a desert, Mr. Governor? Anza-Borrego desert - looking north from Borrego Springs. Editor: We wanted to repost this article as our new governor also wants to close certain parks. This was originally published on June 8, 2009. Have you heard this joke: What happened when the Governor tried to close the desert? The Turkey Vultures went on strike. … Don’t get it? Read on. I wanted to start this post off light-hearted, with a joke even. I get tired and bored with ‘straight’ analytical reports on issues that scream for our attention. Everybody and everything is screaming for our attention these days, so it better be a damn good one. But humor and wit can soften you up, make you susceptible for the author’s hidden or not-so hidden agenda. If you’re already chuckling, then it’s easier to swallow reality pills. Anyways, that’s the theory. Of course, you may lose your reader with a lame joke. Here’s what got me laughing. I read in the Union-Tribune just the other day about how Governor Schwarzenegger wants to close a number of parks, beaches and deserts for budgetary reasons. 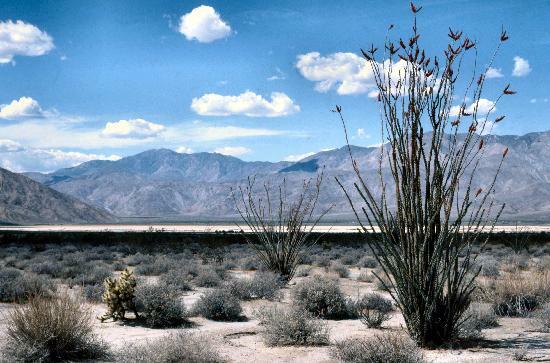 On the list is a desert that’s close to us here in San Diego: Anza-Borrego Desert Park. The Governor wants to save money by firing the park rangers and maintenance people and close it. Park fees do not cover the operational costs for the desert playground. So, bye-bye. Other parks and beaches that do make money will be kept open. But how do you close a desert? Is it like a zoo or a Wild Animal Park, where you can simply close and lock the gates, shutter the Visitors’ Center and send the employees home? Who tells the animals? Somebody’s got to stay with the zoo and animal park animals, at least. But the wild ones? Whose gonna break it to them? And what about the little towns and businesses that cater to the desert visitors? Especially the liquor stores and small markets – what about them? The motels, resorts, and restaurants? Will they all just go along? Back to the desert’s closure. Just an initial thought: wouldn’t the costs of enforcement match the costs of keeping the desert open? I mean, how actually do you close a desert? Obviously, you can’t fence the entire Anza Borrego Desert! Once you close it, how do you keep it closed? How do you enforce it? By helicopter? Well, I going to warn you, Mr. Governor. This won’t be easy – something you should have learned while filming the Terminators. The desert attracts all kinds – and many of those that the desert attracts are strong and rugged individualists, independently and individually-minded, survivalists even. Can you keep them out? They’re a tough bunch. They’ll eat your “Park is closed” signs for lunch. There’s all those hairy and long-haired bikers, too. You’ve seen them in their packs. Are you going to take them on, and tell them the desert roads are closed? They look mean. How do you close a desert without closing the desert roads? It is confusing. And what about all those college kids – taking mushrooms, they’re not going to have a state-of-mind to read the ‘stop’ signs. And what about all those beer-swilling East County kids – riding 3-wheelers and bikes in the dirt. Are you gonna be able to keep those kind out? Their goggles are way too dirty to read any closure signs. And what about the people who go hiking, the cross-country hiking people, who don’t care about trails? They’re so stubborn. They traipse across the countryside, ignoring signs and warning markers enough already. What’s going to happen when you try to close the whole place down with them? Then, there’s those strong-willed bird watchers, who by god, will go to great lengths to see their feathered friends. No desert closure will prevent them from snapping up their binoculars and scanning the bushes and skies. So, you see, Mr. Gov, this is a big challenge, trying to close a desert. You might have to call out the National Guard just to patrol it, to keep out the rugged individualists, the survivalists, the hairy bikers, the mushrooming college kids, the drunk dirt-bikers, the stubborn hikers, and those damn bird watchers. By time you add up all the over-time spent enforcing the ‘keep out’ signs and keeping these stubborn, drunk, bird-watching, rugged, shroomed-out vandals and trespassers from entering your closed desert, you might just think twice, and keep it open, so all these weirdos have a place to go. So’s they’re not in your face. Had me rolling Frank. Everyday its something new with this guy. Next he’s going to just throw in the towel completely, and tell us that the State of California is now closed for business. Guess the Minutemen will be happy. I know I don’t need the Gov’s key to unlock the desert!! I guess I would be one of those “stubborn hikers” that would be hard to keep out. Thanks for the evocative piece, Frank, and thanks for the nice photo at the top . . . it had me thinking of the many beautiful, mindful, and challenging hikes we used to take out there . . . and the beach to mountains to desert drive . . . (an easy daytrip from OB) was a gift in itself. Bingo! You hit it on the head. I used to be one of those mushroom-taking college kids roaming around in the desert. The desert is an amazing place – you have to have loads of respect for it, and you have to know your abilities and strengths, but there’s many hidden, wonderful corners out there. In the early ’70’s the DMV started making owners of off road vehicles register and pay for a yearly sticker that was supposed to fund off road parks and open spaces such as the desert. Where’s that money? Maybe since Darrell Issa bankrolled the Governator’s election or at the very least the ousting of Gray Davis, he should bust out his checkbook and pony up to keep our state moving in a positive direction. DG – I have friends who are off-road enthusiasts, and there is a yearly registration for those vehicles. It would be nice to know where that money actually goes. Maybe Darrell Issa could negotiate with the striking turkey vultures. No, wait… they might eat him. I know where the Spanish explorer Anza traveled, as there is a lone marker out there along a sand road that runs through Collins Valley – northwest of the town of Borrego Springs. To get to Collins Valley, you drive north from Christmas Circle out to the end of the asphalt, then do the bumpy dirt/sand road to Coyote Canyon, where the stream that flows half of the year passes through the first group of willows. Once through Coyote Canyon, I usually head west and southwest towards the paradise known as Cougar Canyon. But to follow Anza, you travel north instead and go through two more bunches of willows. There’s actually a little town called Anza on the other side of the mountains up from there. I’m sure the governor has never been there. But I’ve been going to that area for decades. It’s an arduous trek to Cougar Canyon, but well worth the scrapes, bruises, cuts and exhaustion once you arrive. This is an area of the world you should not enter this time of year. Late May is usually the limit on the calendar. Early Spring is better. Next year I’d be willing to take a group up to Cougar Canyon, where rushing streams and waterfalls and lots of shady trees makes for a memorable time. Normally about 6 people is all the place can handle. Hopefully I can get Patty on this trek as well. If you’d like to go, let me know and start preparing now. It’s a several hour hike over rocks, on sand and up a canyon, and you should stay there at least two nights. It would be a real shame if it was all closed. Off-highway vehicle “green sticker” fees are in large part diverted into the state’s general transportation fund. Much of the rest of the money is spent defending against lawsuits and complying with monitoring/enforcement orders issued by the courts as a result of those lawsuits. The Center for Biological Diversity is one of the most vocal and litigious organizations opposing park access for off-roaders, and many of the court injunctions are at their requests. It should also be taken into account that a considerable portion of desert enthusiasts come from Arizona, whose OHV registration fees are lower and stay in their home state. The Imperial Sand Dunes Recreation Area, one of the largest and most famous off-road parks in the nation, has felt the greatest impact. Use fees have more than tripled in the last five years while accessible areas have been cut by 85% in the last few decades. I can’t say where these funds are going (most probably aren’t leaving the parks they’re generated at), but with more and more users occupying less and less park space as the sport gains in popularity and conservation activists gain territory, the remaining area becomes more adversely impacted by off-road users and the risk of having so many users confined to a small space results in a more dangerous situation with increased collision risks. This confirms the anti-access side’s claim that the sport is too dangerous and, more importantly, environmentally irresponsible. I imagine soon this will result in OHV activity being all but eliminated in the near future, much as it has been at the Oceano Dunes (a.k.a. Pismo Beach). This will likely devistate local communities that receive much of their income from the off-roaders, and it’ll result in reduced funds for transportation, but I don’t see it impacting the financial situations of non-OHV use areas that much. Respectfully visiting state parks and beaches should be a fundamental right as citizens of California, the idea that the Governor can “close” them to the public is a scandal. Absurd, we can’t allow this! Well good luck closing torrey pines to people…you might be able to close the gate but keeping people out is a whole different story. I for one will walk down the beach and find a snake trail to get to the top…. America, land of the free, home of the brave. Buy the people and for the people. Inalienable human rights. First the great American chief broke his promise to the Native Indian, now he breaks it to his own people. Follow his motive for all this control. You can not have recreation without paying a road tax, fish tax, hunt tax, boat tax, wilderness permit tax, and sales with income tax on your gear. You can not have any vehicle without an identification plate or tax. You cannot own a home and not pay property tax. The list goes on ad-nauseum. The motive being the extraction of labor under the illusion of freedom. Welcome to servitude fellow Americans. We are all slaves to the Great White Chief. Freedom is an illusion and not a fact. The only free people are those living on the street. Closing parks and deserts to balance the state budget is NOT the answer. Even though this post pokes fun at our last goberator, the new one – who I voted for – also wants to do it or is at least making noise about it. The costs in closing a park/ desert and then in re-opening it outweigh the benefits and savings. Parks, deserts, national monuments are Americans’ birthright and should not be denied common citizens, who don’t have the moolah to afford the more expensive resorts and spas, which are inevitably private. Let them close the parks and beaches, and lay off those who patrol it. we can simply take back our “public” land right? We can make Frank a park ranger!